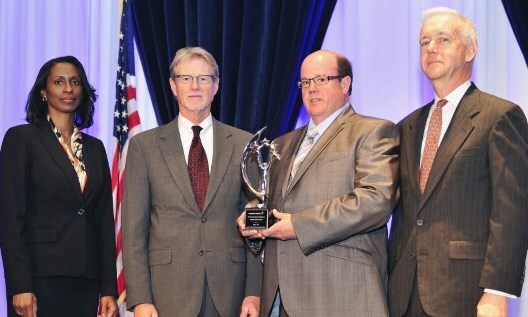 REO recognized for big achievements with Lockheed Martin Small Business AwardREO Inc.
On May 6, REO received acknowledgment for achievement in supporting and strengthening Lockheed Martin’s Global Supply Chain. For the past 20 years, Lockheed Martin Missiles and Fire Control together with Mission Systems and Training have annually recognized small business suppliers providing quality products and services and outstanding support. REO was one of 22 small business suppliers, out of thousands, who were recognized for their commitment to quality and accountability during a special ceremony held during National Small Business Week. REO supports multiple Lockheed Martin Missiles and Fire Control programs. They were recognized for their technical expertise and contribution to affordability and sustainability for both the ongoing Electro-Optical Targeting System (EOTS) program and the startup Target Acquisition Designation Sight (TADS) program. By participating in joint Kaizen events with Lockheed Martin, REO has worked to further reduce cost while maintaining high quality and delivery scores. “REO is honored to be recognized by this very important customer. This award is a reflection of the hard work of all of our employees who committed themselves to customer service, quality and cost reduction initiatives. It is great to receive this recognition as a reminder that we are headed in the right direction but we recognize we have much more to do” stated REO President and CEO, Paul Kelly. With its dynamic manufacturing environment, REO was able to efficiently control production costs while consistently meeting their commitments to Lockheed Martin. Headquartered in Bethesda, Maryland, Lockheed Martin is a global security and aerospace company that employs approximately 112,000 people worldwide and is principally engaged in the research, design, development, manufacture, integration and sustainment of advanced technology systems, products and services. Click here to see a full list of the 2014 Small Business Award winners.